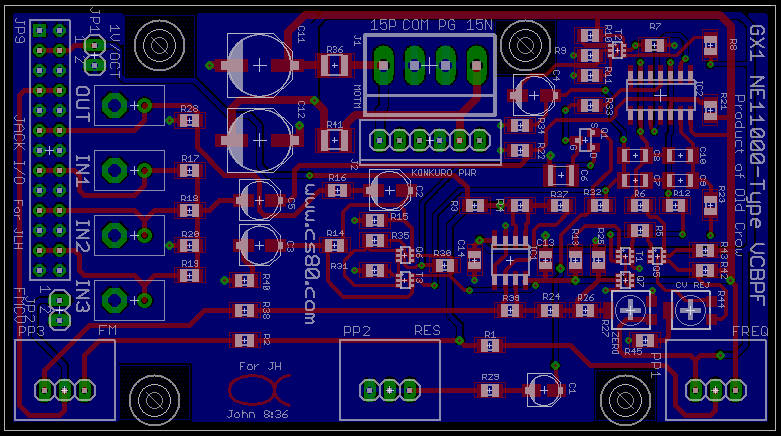 Decided to half-size the NE11K board for production run. There will also be a through-hole edition for DIYers. What is it about this filter that makes it special or unusual? One can ask that about any of the dozens of DIY filters being made, but I'm curious about what distinguishes the GX1 from other similar Sallen-Key 12dB VCFs like Korg Ms20, etc. Of course it often comes down to one's taste, but never having heard a GX1, is there anything else? Just curious. The main thing about Yamaha filters is they were carefully designed to always be within a certain range of control, using limitations on the biasing of gain cells to "always be sibilant, never wild." Of course I removed that restriction when I recreated the NE10400/10500 circuit and turned it into the MOTM-485, but the fact it was designed by folks used to dealing with organ tone systems remains. The bandpass filter was originally a harmonic selector attached to the VCO core (ramp) output with a fixed Q of 5, and was used to select horn overtones in a GX1 voice. Bandpass suggest that this is a Highpass and Lowpass in series. Are you putting 2 filters on one board? Super-bandpass with control of corner frequencies rules. The MOTM GX Highpass is unique in it's creation of overtones. It is always generating aggressive, screaming sound. It is best in normal useage to tame this with a Lowpass as suggested above. I usually put a Ladder filter or LowPassGate behind it when doing monosynth patches. The GX Lowpass is quite normal, though it does have a certain signature sound. Yes, it certainly is. Yamaha used it in the GX1 tone source as an additional harmonic selector of odd harmonics from a (separate) pulse waveform signal buss, something I will have present in the GX1 tone source being planned out now. I just finished up the DIY version of Crow's NE11000. Very nice PCB. It has the same size and mounting holes and pot locations on board so that you can use the L-bracket from the bridechamber for the MOTM micro series filters. Also, the MOTM-490 panel has exactly the same pot and jack configuration so you can use that panel and save on front panel express costs. I just finished so I have to test things out. I quickly ran through some things to make sure it was passing audio. It does and it filters. The output seems particularly low and much lower than my MOTM-485 and MOTM-480. I need to check into that. I did a couple of things that may or may not have an impact on function so I figured I'd post those here to see what others think. I used a 100k linear pot for PP2 instead of 10k pot. On the schematic, it looked like a voltage divider (to my untrained eye) so I also replaced R29 (was 10k) with a 100k resistor to keep the ratio the same. I used BF245B (thought I had A) for the n-channel FET and had to change the S/D/G orientation compared to the silkscreen since pinout was different. Thanks Scott for the heads up on that. I used a CA3046 for IC2. For the zero calibration, I used a gator clip to connect the 1v/oct In on the jack to the ground on the jack. Does that sound correct? Setting frequency pot to CCW, the trimmer went from about 600 mVPP on one end of the trimmer to about 80 mVPP on the other with a signal in Input 1 (or 2 or 3). Both were extremely quiet, in general, but I was not able to make it "inaudible." The audio out characteristics sound like some of the beginning portions of Robert's sample file. However, I do not seem to get much resonance effect and certainly nothing like the beautiful sounds on the sample so I started wondering if switching R29 and PP2 may not be correct. I tried FM'ing and it didn't seem to have much of an effect either. These were VERY quick tests and by no means giving myself to explore a filter that could be subtle. I know from experience there are some filters that will not do anything if things are not set appropriately. If anything jumps out at you folks let me know. I just finished up the DIY version of Crow's NE11000. Very nice PCB. I can't be sure from the photo, but it appears that PCB also lacks gratuitous and inappropriate Bible quotations? Is this filter the same as the MOTM 485? Maybe not its intended purpose, but couldn't you put three in series, and with a few cap changes, make something like the Korg PS 3100 resonator (aka MOTM 410)? its the old PCB, the new is half size I think. the quotes and the fish are for JÃƒÂ¼rgen Haible who used to put them on his PCBs. hello folks ,i just found these schematics on line and i tried to make the MOTM GX but had some issues so this is more then welcome i just wonder about the voltage , the negative voltage is it - 10V ? 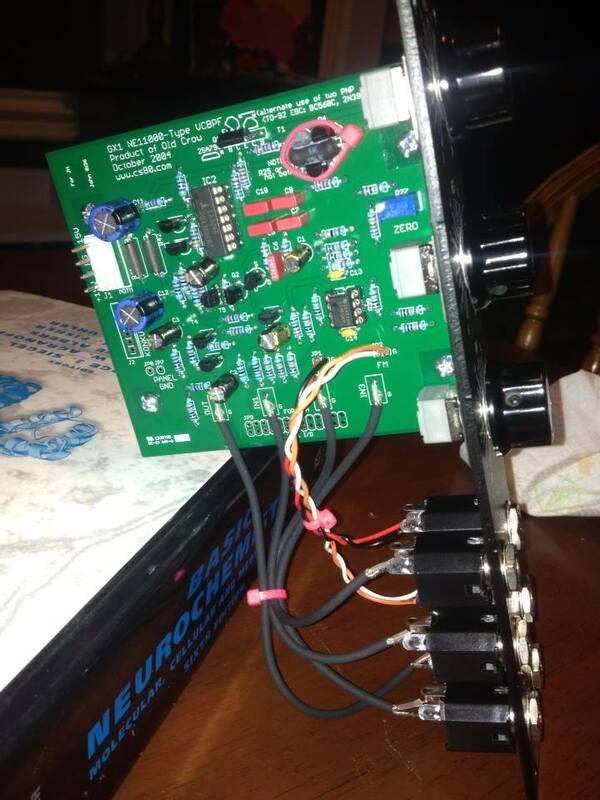 i never used that regulator ,i know it suppose to be better then LM79XX ,i have 15+/- in my synth ,Thanks.